You will hear us say this over and over, but Cloud Native is much more than just adopting cloud technologies. Whether transforming an existing organisation or building a startup from scratch, success depends as much on a company’s culture and leadership as it does on choosing the best tech. As we help guide enterprises through custom cloud migrations, Container Solutions staff have learned a few things about being the kind of company that succeeds in going Cloud Native. One of the key realizations this past year was articulated by our CEO, Jamie Dobson: Continuous Strategic Formulation as a response to the extremely challenging dilemma facing companies today. That is, tools and technologies are changing rapidly and constantly, at the same time that customer demands shift just as quickly and unpredictably — while, at the same time, expecting a fast, seamless and sophisticated experience. The bar is set high and it’s a tough riddle for any company to solve. Worse, nothing stays “solved” for long! 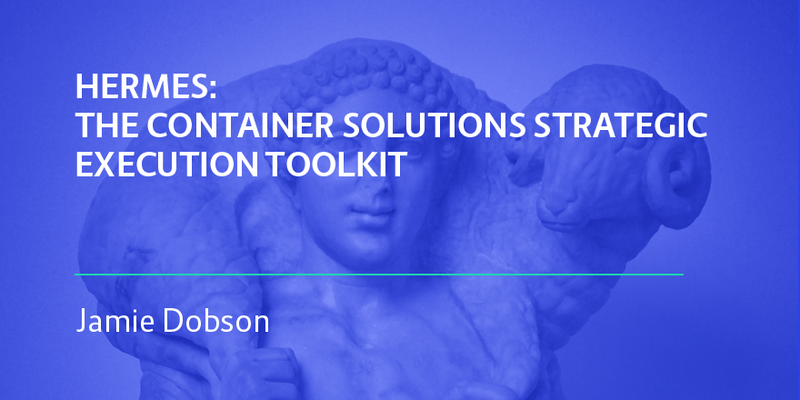 Clients come to Container Solutions chiefly concerned with which tools and technologies their business should commit to. Our primary job, long before getting to containers and Kubernetes, is teaching that you shouldn’t commit to tools and technologies at all. Rather, we help you build a system of management that lets you respond to constant change by responsively and continuously reformulating your plans. Part One of Jamie’s original two-part post explains how Continuous Strategic Formulation works to solve the challenge of continually changing customer demands and continually changing technologies. He illustrates the dilemma at work in the real world using a case study of ING Bank’s move to the cloud. Part Two describes how CSF works and is applied to manage risk and prevent strategic overcommitment while maintaining momentum and responsiveness. Container Solutions came to see that this is such a significant driver of Cloud Native success that we adopted it as best practice for customer cloud migrations. To share that best practice more broadly in the Cloud Native community — as well as helping our customers adopt it effectively — we developed a strategic execution toolkit we call Hermes. Hermes helps teams to reframe how they view risk by framing goals as hypotheses that may (or may not) survive contact with reality. Hermes helps teams manage risk, maintain momentum and deal with strategic overcommitment. Hermes allows its users to balance focus and learning, and in doing so, lets companies experiment their way into their Cloud Native transformation. How does it do this? Through a structured execution model that leaves space to think. Download the free toolkit to learn how to move fast without breaking everything!